Subjects and participants visit our site from the Greater Indianapolis area and the Indianapolis metro area reaching a minimum of a 50-mile radius. The population is very diverse in career, socioeconomic and education levels making us very successful in fulfilling enrollment criteria. 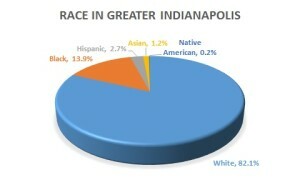 The population in the Indianapolis region is 1,607,486. Median household income is $45,548. Percentage of a college education or better is 26.87%. This diverse population will contribute to success in your clinical trial or marketing study.